A human is a member of the species Homo sapiens, which means 'wise man' in Latin. Biologists, since Linnaeus, put humans in the mammalian order of primates. Apes are also primates, and are the nearest animal relations to humans. Humans, like other primates, are social animals. They usually live in groups, helping and protecting each other, and caring for their offspring (children). Humans are bipedal, which means they walk on two legs. Humans have a complex brain, which lets them use language, make ideas, and feel emotions. This brain, and the fact that arms are not needed for walking, lets humans use tools, which they do more than any other species. There are humans living on every continent. There are over 7 billion people living on planet Earth, as of 2012. Humans have a long period of development after birth. Partly, this is because they have a great deal to learn. Their life depends less on instinct than other animals, and more on learning. Humans are also born with their brains not so well developed as other mammals. There is a good reason for this. If their brains were better developed they would be larger, and this would make birth more difficult. In birth, the baby's head has to get through the 'birth canal', which is a passageway through the mother's pelvis. Many animals use signs and sounds to communicate with each other. But humans have a special system called language. It allows them to express ideas by using words. Humans are capable of making abstract ideas and communicating them to others. Human language can express things that are not present, or talk about events that are not happening at that time. The things might be elsewhere, and the events may also have occurred at another place or time. No known animals have a system of communication that is as elaborate as human language. By using words to communicate with each other, humans make complex communities with laws, traditions and customs. Humans like to understand the world around them. They try to explain things through myth, science and philosophy. Wanting to understand things has helped many humans make important discoveries. Humans are the only species living today known to build fires, to cook their food and wear clothes. Humans use more technology than any other animal on Earth ever has. Humans like things that are beautiful and like to make art, literature and music. Humans use education and teaching to pass on skills, ideas and customs to the next generations. Biologists explain the similarity between humans and other apes by their descent from a common ancestor. In 2001, a hominid skull was discovered in Chad. The skull is about 7 million years old, and has been classified as Sahelanthropus tchadensis. This skull may show that the date at which humans started to evolve (develop differently) from other primates is 2 million years earlier than scientists had previously thought. Humans are part of a subfamily called the Homininae (or hominins), inside the hominids or great apes. Long ago, there used to be other types of hominins on Earth. They were like modern humans, but not the same. Homo sapiens are the only type of hominins who are alive today. The earliest known fossils of genus Homo have been called Homo habilis (handy man). The first fossils of Homo habilis were found in Tanzania. Homo hablilis is thought to have lived about 2.2 to 1.7 million years ago. Another human species thought to be an ancestor of the modern human is Homo erectus. There are other extinct species of Homo known today. Many of them were likely our 'cousins', as they developed differently than our ancestors. A theory called the Sahara pump theory has been used to tell how different species of plants and animals moved from Africa to the Middle East, and then elsewhere. Early humans may have moved from Africa to other parts of the world in the same way. The first truly modern humans seem to have appeared between 200,000 and 130,000 years ago. These early humans later moved out from Africa. By about 90,000 years ago they had moved into Eurasia and the Middle East. This was the area where Neanderthals, Homo neanderthalensis, had been living for a long time (at least 350,000 years). By about 42 to 44,000 years ago Homo sapiens had reached western Europe, including Britain. In Europe and western Asia, Homo sapiens replaced the Neanderthals by about 35,000 years ago. The details of this event are not known. At roughly the same time Homo sapiens arrived in Australia. Their arrival in the Americas was much later, about 15,000 years ago. All these earlier groups of modern man were hunter-gatherers. Stonehenge in England was built around 4500-4000 years ago. This time was in the Neolithic period of the Stone Age. Early human history is commonly divided into three ages. The time periods are labeled with the material used for tools. The "Stone Age" is commonly subdivided into the Paleolithic, Mesolithic and Neolithic periods. Up to about 10 thousand years ago most humans were hunter-gatherers. That means they hunted for their food or gathered it from wild plants. Most humans at this time did not live in one place, but moved around as the seasons changed. The start of planting crops for food, called farming, meant that some people chose to live in settlements. This also led to the invention of metal tools and the training of animals. About 6000 years ago the first proper civilizations began in places like Egypt, India and Syria. The people formed governments and armies for protection. They competed for area to live and resources and sometimes they fought with each other. About 4000 years ago some states took over or other states and made empires. Examples include ancient Greece and the Roman Empire. Some modern day religions also began at this time such as Judaism and Hinduism. From the Middle Ages and beyond humanity saw an explosion of new technology and inventions. The printing press, the car, the train and electricity are all examples of this kind of invention. As a result of the developments in technology, modern humans live in a world where everyone is connected, for example by telephone or by internet. People now control and change the environment around them in many different ways. Humans can now change their environment to solve problems. The many tall buildings in Hong Kong are an example of people solving the problem of too many people in one place. In early times, humans usually settled near to water and other natural resources. In modern times if people need things they can transport them from somewhere else. So basing a settlement close to resources are is no longer as important as it once was. Since 1800 the number of humans, or population, has increased by six billion. Most humans (61%) live in Asia. The rest live in the Americas (14%), Africa (14%), Europe (11%), and Oceania (0.5%). Most people live in towns and cities. This number is expected to get higher. In 2005 the United Nations said that by the end of that year, over half the world would be living in cities. This is an important change in human settlement patterns: a century earlier in 1900 only 14% of people lived in cities, in 2000 47% of the world's population lived in cities. In developed countries, like the United States, 80% of the population live in cities. A diagram of a male human skeleton which has 206 bones. Human body types can be very different from each other. The average height of an adult human is between 5 and 6 feet. The average weight is between 76 and 83 kg for males and 54–64 kg for females. Human hair grows on the underarms, the s and the top of the head in both genders, and on the chest, legs, back and face of males. Although it might look like humans have less hair than most primates they actually do not. The average human has more hair follicles, where hair grows from, than most chimpanzees. Human hair can be brown, red, blonde or most commonly black. Modern humans can also have their hair in many different colours by using dye. When humans get older hair can turn grey or even white. Human skin colours vary greatly. They can be a very pale pink all the way up to dark brown. There is a reason why peoples in tropical areas have dark skins. The dark pigment (melanin) in the skin protects them against ultraviolet rays in sunlight. The damage caused by UV rays can and does cause skin cancer in some people. Therefore, natural selection favours darker skin colour. Sun tanning has nothing to do with this issue, because it is just a temporary process which is not inherited. In colder climates the advantage of light-coloured skin is that it radiates less heat. Humans are not as strong as other primates of the same size. An average female orang utan is at least three times as strong as an average human man. The average human male needs 7 to 8 hours sleep a day. People who sleep less than this are generally not as healthy. A child needs more sleep, 9 to 10 hours on average. A human foetus at 7 weeks old. The human life cycle is quite like most other mammals. The young grow inside the female mother for nine months. Unlike most other animals human childbirth is quite dangerous. Because human brains are so big, babies' heads are wide. The mothers pelvis bones are also not very wide because people walk on two legs. This combination means that quite often either mother and/or baby die in childbirth. The number of mothers dying in childbirth is less in the 21st century. This is because of better medication and treatment. In many poor countries the number of mothers dying is very high. Sometimes it is up to 10 times as many as richer countries. The average human baby weighs 3 – 4 kg at birth and is 50–60 cm tall. This is often less in poorer countries. Many babies in poor countries often die early because of this. Humans have four stages in their lives: infancy, adolescence, adulthood and old age. Life expectancy is how long you are expected to live for. This depends on many things including where you live. The highest life expectancy is for people from Hong Kong, (84.8 years). The lowest is for people from Swaziland where, mainly because of AIDS, life expectancy is only 31 years. Psychology is the study of how the human mind works. The human brain controls everything the body does[source?]. Everything from moving and breathing to thinking is done by the brain. Neurology is the study of how the brain works, psychology is the study of how and why people think and feel. Human behaviour is hard to understand, so sometimes psychologists study animals because they may be simpler and easier to understand. Psychology overlaps with many other sciences including Medicine, Biology, Computer Science and Linguistics. Language at its most basic is talking, reading and writing. The study of language is called linguistics. Humans have the most complicated languages on Earth. Human language is much more complicated than any other species. There are 7,300 languages spoken around the world as of 2008. The world's most spoken first language as of 2008 is Mandarin Chinese, however, the most spoken language (first, second, etc.) is English. Art has existed almost as long as humans. People have been doing some types of art for thousands of years as the picture on the right shows. Art represents how someone feels in the form of a painting, a sculpture or a photograph. Music has also been around for thousands of years. Music can be made with only your voice but most of the time people use instruments. Music can be made using simple instruments only such as simple drums all the way up to electric guitars, keyboards and violins. Music can be loud, fast, quiet, slow or many different styles. Music represents how the people who are playing the music feel. Literature is anything made or written using language. This includes books, poetry, legends, myths and fairy tales. Literature is important as without it many of the things we use today, such as Wikipedia, wouldn't exist. Humans often categorize themselves by race or ethnicity. Human races are questionable as valid biological categories. Human racial categories are based on both ancestry and visible traits such as skin color and facial features. These categories may also carry some information on non-visible biological traits, such as the risk of developing particular diseases such as sickle-cell disease. Current genetic and archaeological evidence generally support a "recent single origin" of modern humans in East Africa. Current genetic studies show that humans from Africa are most genetically diverse. But, human gene sequences are very similar compared to many other animals. Ethnic groups are often linked by linguistic, cultural, ancestral, and national or regional ties. Race and ethnicity can lead to different social treatment called racism. Religion is a belief in a higher being, spirit, or any system of ideas a group of people believe in. People who believe something strongly have faith in whatever it is they believe. Faith can bring people together because they all believe in the same thing. Some of the things religions talk about are what happens after death, why humans exist, how humans came to exist (Creation), and what is good to do and not to do (morality). Millions of people believe in God, some people are very religious, some people are atheist and believe in no god, and some people believe a mixture of science and religion. 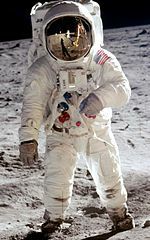 In the 20th century technology moved forward enough to allow a person to land on the Moon. Technology are the things and methods which humans use to make tasks easier. Science is understanding how the universe and the things in it work. Technology used to be quite simple. It was passed on by people telling others, until writing was invented. This allowed technology to develop much quicker. Now people understand more and more about the world and the universe. The use of the telescope by Galileo, Einstein's theory of relativity and the big bang theory are all big technological – to do with technology – discoveries. Technology has come forward enough to allow things such as the internet, space travel and television. A war is a conflict between large groups of people, usually countries or states. A war often involves the use of dangerous force as both sides try to kill the other. It is estimated that during the 20th century between 167 and 188 million humans died because of war. The people who fight in wars are called soldiers. Modern wars are very different from wars a thousand or even a hundred years ago. Modern war involves sabotage, terrorism, propaganda, and guerrilla warfare. In modern day wars civilians – people who are not soldiers – are often targets. An example of this is the atomic bomb dropped on Hiroshima and Nagasaki at the end of World War II. The bombs killed as many as 140,000 people in Hiroshima and 80,000 in Nagasaki by the end of 1945, about half on the days of the bombings. Since then, thousands more have died from wounds or illness because of exposure to radiation released by the bombs. In both cities, the overwhelming majority of the dead were civilians. In Germany, Austria, and Great Britain, conventional bombs were used. About 60,595 British, and 550,000 German, civilians were killed by planes bombing cities. ↑ "A Timeline of Life". http://exploringorigins.org/timeline.html. ↑ "World pop clock". US Census Bureau. http://www.census.gov/ipc/www/popclockworld.html. ↑ 5.0 5.1 Collins, Desmond (1976). The Human Revolution: from ape to artist. pp. pp.208. The studies showed that, after 6.5 million years of evolution as separate species, between 95% and 99% of the DNA of humans and chimpanzees is the same. The difference between a human and a chimpanzee was about ten times greater than the difference between two unrelated humans. When this difference is compared with the difference between the DNA of mice and rats, the difference between a mouse and a rat is ten times greater than the difference between a human and a chimpanzee. ↑ Britten RJ (2002). "Divergence between samples of chimpanzee and human DNA sequences is 5%, counting indels". Proc Natl Acad Sci U S A 99 (21): 13633–5. doi:10.1073/pnas.172510699 . PMID 12368483 . http://www.pnas.org/cgi/content/full/99/21/13633. ↑ Wildman D. et al (2003). "Implications of natural selection in shaping 99.4% nonsynonymous DNA identity between humans and chimpanzees: enlarging genus Homo". Proc Natl Acad Sci U S A 100 (12): 7181–8. doi:10.1073/pnas.1232172100 . PMID 12766228 . http://www.pnas.org/cgi/content/full/100/12/7181. ↑ Ruvolo M (1997). "Molecular phylogeny of the hominoids: inferences from multiple independent DNA sequence data sets". Mol Biol Evol 14 (3): 248–65. PMID 9066793 . http://mbe.oxfordjournals.org/cgi/reprint/14/3/248. ↑ Brunet M. et al. (2002). "A new hominid from the Upper Miocene of Chad, Central Africa". Nature 418 (6894): 145–51. doi:10.1038/nature00879 . PMID 12110880 . http://www.nature.com/nature/journal/v418/n6894/full/nature00879.html. ↑ Except that, in the opinion of some, chimpanzees are also hominins. ↑ New York Times article Fossils in Kenya challenge linear evolution published August 9, 2007 says "Scientists who dated and analyzed the specimens — a 1.44 million-year-old Homo habilis and a 1.55 million-year-old Homo erectus — said their findings challenged the conventional view that these species evolved one after the other. Instead, they apparently lived side by side in eastern Africa for almost half a million years". ↑ F. Spoor et al. (9 August 2007). "Implications of new early Homo fossils from Ileret, east of Lake Turkana, Kenya". Nature 448 (448): 688–691. doi:10.1038/nature05986 . ↑ Strait DS, Grine FE, Moniz MA (1997). "A reappraisal of early hominid phylogeny". J. Hum. Evol. 32 (1): 17–82. doi:10.1006/jhev.1996.0097 . PMID 9034954 . ↑ Alemseged, Z., Coppens, Y., Geraads, D. (2002). "Hominid cranium from Omo: Description and taxonomy of Omo-323-1976-896". Am J Phys Anthropol 117 (2): 103–12. doi:10.1002/ajpa.10032 . PMID 11815945 . ↑ "Fossil feces is earliest evidence of North American humans". http://news.nationalgeographic.com/news/2008/04/080403-first-americans.html. ↑ "World population reaches six billion". http://news.bbc.co.uk/1/hi/sci/tech/411162.stm. ↑ Whitehouse, David (19 May 2005). "Half of humanity set to go urban". BBC News. http://news.bbc.co.uk/1/hi/sci/tech/4561183.stm. ↑ "Evolution, IQ, and Domain General Mechanisms". http://www.csulb.edu/~kmacd/346IQ.html. ↑ [http://www.grida.no/climate/ipcc_tar/wg1/007.html "Climate Change 2001: Working Group I: The Scientific Basis"]. http://www.grida.no/climate/ipcc_tar/wg1/007.html. ↑ "Averages and Human Weight". http://www.articleworld.org/index.php/Human_weight. ↑ Why humans and their fur parted way by Nicholas Wade, New York Times, August 19 2003. ↑ Rogers, Alan R., Iltis, David & Wooding, Stephen (2004). "Genetic variation at the MC1R locus and the time since loss of human body hair". Current Anthropology 45 (1): 105–108. doi:10.1086/381006 . ↑ This is basic physics, see black body radiation. ↑ Robin, Ashley 1991. Biological perspectives on human pigmentation. Cambridge: Cambridge University Press. ↑ Muehlenbein, Michael 2010. Human evolutionary biology. Cambridge University Press, 192–213. ↑ Schwartz, Jeffrey (1987). The Red Ape: Orangutans and Human Origins. pp. pp.286. ISBN 0813340640 . ↑ Rush D (2000). "Nutrition and maternal mortality in the developing world". Am J Clin Nutr 72 (1 Suppl): 212 S–240 S. PMID 10871588 . ↑ "Big Birth Weight Babies". http://www.justparents.co.uk/blog-entry-1373.html. ↑ Khor G (2003). "Update on the prevalence of malnutrition among children in Asia". Nepal Med Coll J 5 (2): 113–22. PMID 15024783 . ↑ [www.cia.gov/library/publications/the-world-factbook "CIA – The World Factbook"]. www.cia.gov/library/publications/the-world-factbook. ↑ "The 30 Most Spoken Languages of the World". http://www.krysstal.com/spoken.html. ↑ Royal C. & Dunston G (2004). "Changing the paradigm from 'race' to human genome variation". Nat Genet 36 (11 Suppl): S5–7. doi:10.1038/ng1454 . PMID 15508004 . http://www.nature.com/ng/journal/v36/n11s/full/ng1454.html. ↑ Risch N. et al (2002). "Categorization of humans in biomedical research: genes, race and disease". Genome Biology 3 (7): comment2007.2001 – comment2007.2012. doi:10.1186/gb-2002-3-7-comment2007 . PMID 12184798 . ↑ Hua Liu, et al. (2006). "A Geographically Explicit Genetic Model of Worldwide Human-Settlement History" (Scholar search). The American Journal of Human Genetics 79: 230–237. doi:10.1086/505436 . http://www.journals.uchicago.edu/AJHG/journal/issues/v79n2/43550/43550.html. ↑ Jorde L, Watkins W, Bamshad M, Dixon M, Ricker C, Seielstad M, Batzer M (2000). "The distribution of human genetic diversity: a comparison of mitochondrial, autosomal, and Y-chromosome data". Am J Hum Genet 66 (3): 979–88. doi:10.1086/302825 . PMC 1288178 . PMID 10712212 . ↑ "The use of racial, ethnic, and ancestral categories in human genetics research". Am. J. Hum. Genet. 77 (4): 519–32. October 2005. doi:10.1086/491747 . PMC 1275602 . PMID 16175499 . ↑ Bamshad M, Wooding S, Salisbury BA, Stephens JC (August 2004). "Deconstructing the relationship between genetics and race". Nat. Rev. Genet. 5 (8): 598–609. doi:10.1038/nrg1401 . PMID 15266342 . ↑ Tishkoff SA, Kidd KK (November 2004). "Implications of biogeography of human populations for 'race' and medicine". Nat. Genet. 36 (11 Suppl): S21–7. doi:10.1038/ng1438 . PMID 15507999 . ↑ Jorde LB, Wooding SP (November 2004). "Genetic variation, classification and 'race'". Nat. Genet. 36 (11 Suppl): S28–33. doi:10.1038/ng1435 . PMID 15508000 . ↑ "Frequently Asked Questions #1". Radiation Effects Research Foundation. http://www.rerf.or.jp/general/qa_e/qa1.html. Retrieved 2007-09-18. ↑ Rezelman, David; F.G. Gosling and Terrence R. Fehner (2000). "THE ATOMIC BOMBING OF HIROSHIMA". The Manhattan Project: An Interactive History. U.S. Department of Energy. http://www.cfo.doe.gov/me70/manhattan/hiroshima.htm. Retrieved 2007-09-18. page on Hiroshima casualties. 60,600: John Ellis, World War II : a statistical survey (Facts on File, 1993) "killed and missing"
92,673, (incl. 30,248 merchant mariners and 60,595 killed by bombing): Encyclopaedia Britannica, 15th edition, 1992 printing. "Killed, died of wounds, or in prison .... excluding those who died of natural causes or were suicides." 100,000: William Eckhardt, a 3-page table of his war statistics printed in World Military and Social Expenditures 1987–88 (12th ed., 1987) by Ruth Leger Sivard. "Deaths", including "massacres, political violence, and famines associated with the conflicts." Wikispecies has information on: Homo sapiens. This page was last changed on 14 September 2016, at 20:53.